This is a mistake. It is vitally important that your board be involved in the fundraising process. Without the help of a supportive, active and energetic board, you are fundraising with one hand tied behind your back. Every non-profit, no matter how small or large, deserves a board that is passionate about fundraising. This might sound cliché, but it’s not: the first thing you need to do is create a culture of philanthropy at your organization. When I say “culture of philanthropy,” I’m not talking about some wishy-washy rah-rah about dedicating 10 minutes of every board meeting to a fundraising update. I’m talking about something much, much more. You need to make it clear to your staff, your board, your volunteers and your donors how important fundraising is to your organization. In fact, you need to tell everyone who will listen that fundraising is the most important thing you do at your non-profit, because it allows you to carry out your work and fulfill your mission. Most organizations have unintentionally built a culture where programs come first, and fundraising is a necessary evil. If that’s the case at your non-profit, it’s no wonder that board members want to work with the program staff and not the development team. Put fundraising first. Develop a culture of philanthropy at your non-profit where fundraising = mission and you’ll have a much easier time getting your board interested in fund development. When your board of directors hears the word “fundraising,” they probably think about sitting across from a friend awkwardly asking for money. That doesn’t sound like much fun to most board members, and so most board members will avoid it. Take the time to explain to your board what fundraising really means, and to highlight all of the different ways your board can help your development team without asking for money. 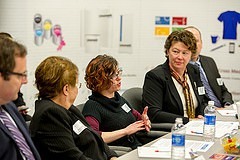 Teach your board that what you really need them to be are ambassadors for your non-profit. You need your board to go out and make connections for your organization and for your development team, and then let the pros handle it from there. Board members can set up meetings and calls, they can hold non-ask events or invite their friends to the non-ask events your organization already has set up, they can make thank you calls to donors, help build relationships through donor clubs and affinity groups, and more. Show your board how much they can help without ever making an ask. After all, who doesn’t want to serve as an ambassador for a cause they feel passionate about? One of the best things you can do to help your board feel good about fundraising is to set them up for success by providing them with lots of easy ways to get involved. Set up non-ask events, and make it easy for your board to invite their friends. Provide training for your board on how to serve as great ambassadors, how to talk about your organization’s mission, and give them lots of emotional stories about your work that they can tell to the folks in their network. Give your board members brochures, business cards, and lapel pins that help jumpstart conversations about your work. Publish white papers they can share with their colleagues. Give them a framed picture of the last time they worked on a volunteer project at your non-profit. Make it easy for your board members to talk about your organization, and they will. The truth is that not everyone is cut out to be on your non-profit’s board of directors. If you work hard to create a culture of philanthropy at your organization, teach your board what fundraising really means, and provide great opportunities for your board to share your story, and certain board members still won’t get involved with fundraising, it’s important that you put the organization first. Board members who won’t help fundraise are a drag on the organization as a whole, and on other board members who do want to get involved with development. As fundraisers and non-profit managers, we often put feelings before the organizations we work with… we get sentimental about certain board members, and keep them on year after year, even though they are hurting the organization as a whole. If you have board members who won’t help fundraise by serving as ambassadors for your non-profit, even after you have worked hard at the strategies mentioned above, let the board member term out from your board. Explain to him or her that the board is moving in a new, fundraising-focused direction. Thank them for their service, and ask them if you can call on them for advice or guidance in the future. As often as not, a board member who terms off a board in a circumstance like this is relieved, because they know that if they stay on the board they will need to start fundraising, and they would rather not. Put the organization first, and build the board of directors your non-profit… and your mission… deserves.